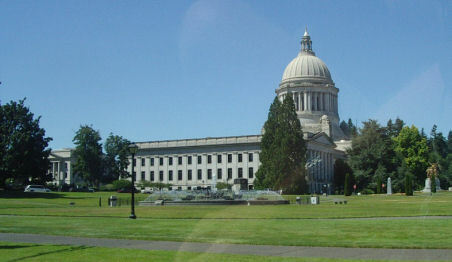 Olympia, the state capital of Washington, is located on the southern end of Puget Sound on Budd Inlet. Washington State Capitol, Olympia, WA. Go Northwest photo by Ray Maxwell. Inspired by the Olympic Mountains. Mt. Olympus is the highest of these, and the first geographical feature in the present state of Washington to be named by western explorers. Olympus is the Greek name for the "home of the gods".